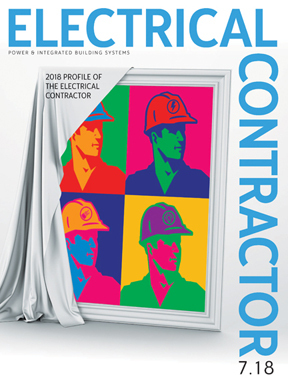 Electrical Contractor magazine has presented the annual NECA Showstopper winners for more than 30 years. The NECA Showstopper Showcase and Awards is the most prestigious recognition event in the electrical construction industry. The Showcase is designed to introduce new products and services designed to help electrical contractors do their work. This highly-effective and cost-efficient area opens each day one hour before the NECA Show exhibit hall. This program is open only to 2019 NECA exhibitors. Judging is conducted by a panel of independent industry experts. Entries will be judged on Sunday morning, September 15, 2019, and winners will be notified in their booths that day A blue ribbon will be placed on winning entries, and a trophy will be presented to the winning company. Exhibitors will be able to enter 2019 submit new products beginning May 15, 2019. ▪ The Showstopper Showcase and Awards are for new Products and services that have been introduced and are available in the electrical market since October 1, 2018 – October 1, 2019 are elligible. That means products on the market before this date do not qualify, and prototypes not available at the time of the show do not qualify. This program is open ONLY to confirmed 2019 NECA Show exhibitors. ▪ Products that have previously won a NECA Showstopper do not qualify for entry, including products that been acquired from other companies and were winners under a different product name. ▪ Entries MUST clearly describe the product and its functions and IF there is a model number or trade name, they should be included in the description. • Products/services that do well in Showstopper competition are clearly identified on the Showstopper table display regarding what the product is, what it does, what its key features are, and how they benefit users. Display cards or posters should present information concisely in easy-to-understand language. Exclusive features not previously available should be emphasized, but exaggerated claims and meaningless hyperbole are not received favorably by the judges, who consider entries from the perspective of electrical professionals who are experienced and savvy buyers. ▪ To be considered for judging, all entries MUST be set in the Showstopper Showcase area no later than 5 p.m. PST Saturday September 14, 2019. NO EXCEPTIONS. ▪ Note: Final decisions are the sole discretion of the judges.